wanderlust ATLANTA: The Art of John Lennon...in nearby Roswell! While music is remembered as Lennon's most popular art form, he loved both literature and visual art, having studied a Liverpool Art Institute before The Beatles was formed. I never knew this, but he penned and illustrated three books, and he continued to draw throughout his life. The posthumous, limited edition prints in the exhibition are adapted from Lennon's original drawings. The art has been selected from rare archival sketches and is representative of his whimsical and thought-provoking imagery. 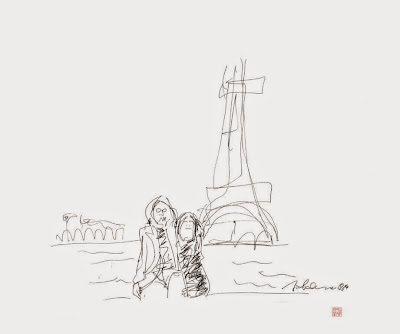 Each print is reproduced utilizing the sophisticated and detailed standards typical for archival fine art printing processes, guided, approved and hand-signed by none other than Yoko Ono. I don't remember not being a fan of The Beatles. I remember like it was yesterday listening to my favorite Beatles song, Revolution, as loud as possible during my senior year in high school in Pinedale, Wyoming. That was long before iPods and even before I owned a Walkman! In fact, I played the song on a record player in the school's Art Room, which was, in effect, a huge warehouse. The sound of the loud rock music was quite the contrast of the country music I was raised on. I'll always be a Beatles fan and now that I've learned that John Lennon was also a visual artist, I'm an even bigger fan! Scheduled events during the exhibition will feature programming led by Collection Curator, Lynne Clifford, a noted authority on the works of John Lennon. All events are complimentary and open to the public! "It is a rare opportunity to be able to view over 70 works by John Lennon in a gallery exhibit. The art on exhibition at the Ann Jackson Gallery comprise the years from 1964 through 1980," said Collection Curator Lynne Clifford. It was years after high school, on a vacation to New York City, that I happened upon the black and white Greco-Roman mosaic bearing the word "Imagine", located in Strawberry Fields in Central Park. Yoko Ono says, speaking of John Lennon's song of the same title, "That song was John's plea for us all to envision a world without conflict or division, and imagine instead a world of peace." Perhaps one day the world will give peace a chance. Fast-forward many years, after I'd moved to Atlanta, I was on a date at a Tex-Mex restaurant at the corner of Howell Mill Road and Collier Road where a mariachi band playing songs like Margharitaville and La Bamba. The band was taking requests. A table of four young ladies whispered their request to the band and without hesitation the band broke into "We all live in a yellow submarine..."! The restaurant has long since been torn down, but that Beatles memory endures! I was too young to ever attend a Beatles concert, although I thoroughly enjoyed seeing the Beatles tribute band RAIN perform at The Fox Theatre. That was an on-your-feet show! Forty-five years after the quartet disbanded and thirty-five years after John Lennon's murder, The Beatles and John Lennon continue to bring me and millions of others great joy. 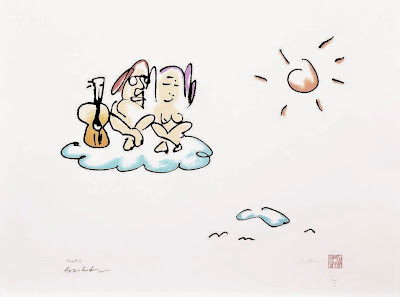 The Art of John Lennon will be at the Anne Jackson Gallery in Roswell, May 29 through May 31, 2015. All events are complimentary and open to the public and all artwork in the exhibition is available for acquisition. Whether John Lennon's messages resonate with you or you're a fan of all Beatles music or you're an enthusiast for unique art viewing opportunities, make your way to see The Art of John Lennon.